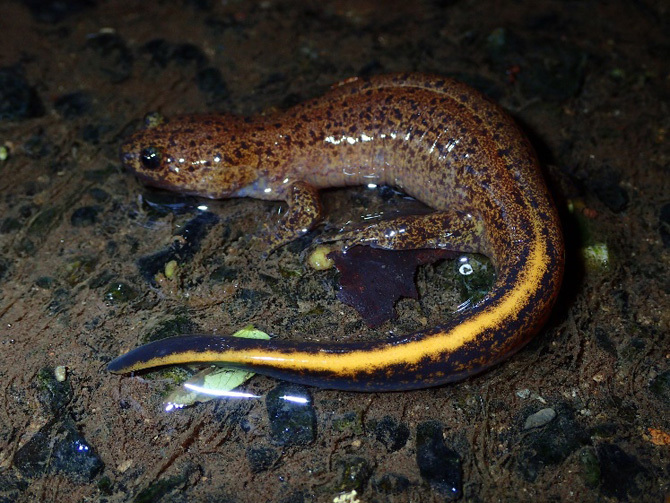 The Tsushima salamander Hynobius tsuensis Abe, 1922, is endemic to Tsushima Island, Japan. Mitochondrial cytochrome b (Cyt b) gene sequences of 1141 bp revealed that H. tsuensis comprised two genetic groups, Groups A and B, with some sympatric populations, and Group A also comprised two subgroups, A-1 and A-2. Phylogenetic analyses based on Cyt b gene sequences of H. dunni, H. nebulosus, H. nigrescens, H. leechii, H. quelpaertensis, and H. yangi, showed that both H. tsuensis and H. nebulosus are polyphyletic. Furthermore, Group B of H. tsuensis is closer to H. nebulosus in Kyushu than it is to Group A. The genetic p-distance between Groups A and B is as large as that separating distinct species, and the two groups might be distinguishable ecologically and morphologically as well. We estimated Groups A and B of H. tsuensis, H. dunni, H. nebulosus in Kyushu, H. leechii, H. quelpaertensis, and H. yangi to have diverged from one another during the Miocene to Pleistocene epochs. To estimate the genetic diversity of the black woodpecker Dryocopus martius, nucleotide sequences of the control region of mitochondrial DNA were analyzed using skeletal muscle, feathers, or intestinal mucosal cells from feces as the source of total genomic DNA. The total length of the control region was 1,187 or 1,188 bp. Eleven haplotypes were detected in 7 and 15 samples obtained from Hokkaido and Honshu, respectively, in Japan. 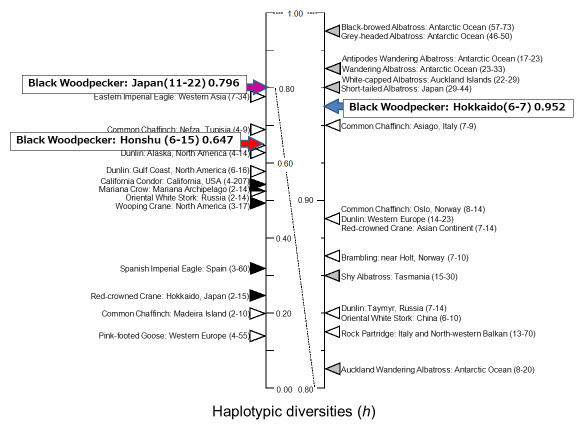 Furthermore, nucleotide diversity (π; Nei 1987) and haplotypic diversity (h; Wenink et al. 1993) were calculated. The π values were 0.00282 and 0.00216, and the h values were 0.952 and 0.647 in the Hokkaido and Honshu samples, respectively. Despite the larger sample size from Honshu, both the π and h values in the Honshu samples were obviously lower than those in the Hokkaido samples. In addition, the h in the Honshu samples was nearly equal to that in the samples from the Northern Europe population of the pink-footed goose (0.645 ± 0.038; Ruokonen et al. 2005). These findings indicate that inbreeding depression would be a concern for this species population in Honshu. In the late part of the nineteenth century and the early part of the last century, the short-tailed albatross Phoebastria albatrus was in danger of extinction owing to feather hunting. In the middle of the last century, the total number of this species was inferred to be approximately 50–60 with breeding occurring only on Torishima Island of the Izu Islands. Recently, the number of individuals has increased to more than 2,000 and that of their breeding islands to three, namely, Torishima Island, and Minamiand Kita-kojima Islands of the Senkaku Islands. Here, we show that the 44 short-tailed albatrosses we examined represent 29 haplotypes in the control region of mitochondrial DNA, and have a considerably higher genetic diversity than most avian species, but not very high in albatross species; the h and π were 0.96 and 0.013, respectively. However, the parsimony network clearly showed that many intermediate haplotypes were lost. It was concluded that the majority of the haplotypes in the founder population have been maintained. 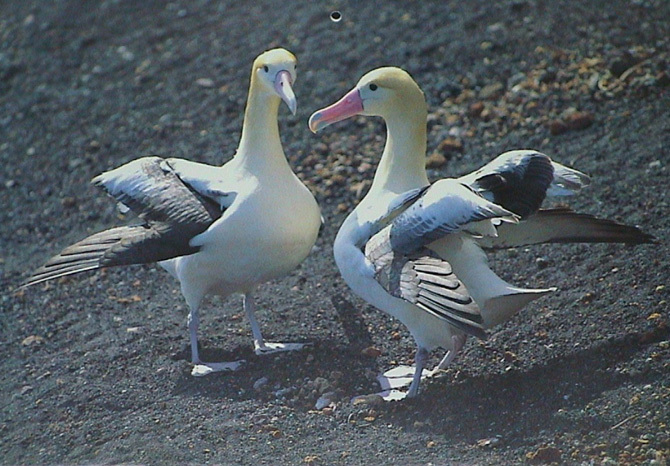 Judging from these ﬁndings and the exponential increase in the number of individuals, the present population of the short-tailed albatross seems not to be affected by inbreeding depression through a severe bottleneck. The conservation and expansion of their breeding grounds, and effective protection from bycatch mortality in foraging areas are important for the future survival of this species. The relationships of 13 species of the genus Hynobius, namely, H. abei, H. boulengeri, H. dunni, H. kimurae, H. leechii, H. lichenatus, H. nebulosus, H. nigrescens, H. okiensis, H. retardatus, H. takedai, H. tokyoensis, H. tsuensis, and the sole member of the genus Salamandrella, Salamandrella keyserlingii, that gave multiple bands when their chromosomes were treated with BrdU could be clarified. Analysis of the late-replication and C-banding patterns of the chromosomes of these species showed that the proportion of the homoeologous region among twelve of the Hynobius species, except H. retardatus, was approximately 90%, and that among the 13 Hynobius species, including H. retardatus, was approximately 65% in their total genomes. Furthermore, the proportion of the homoeologous region decreased to approximately 20% between Hynobius and Salamandrella. These differences in the proportion of the homoeologous region are not due to the difference in the amount of chromatin in their total genomes because the total chromosome length among all the 14 species is, in nearly all cases, almost equal at the same condensation. Thus, should phylogenetic distance be determined directly on the basis of the banding patterns, the 12 Hynobius species are logically quite close to each other, H. retardatus is distant from the other Hynobius species, and S. keyserlingii is distant from all the 13 Hynobius species. The chromosomes of Onychodactylus japonicus, however, gave no distinct bands. Therefore, the genus Onychodactylus seemed phylogenetically distant from the genera Hynobius and Salamandrella. For further clarification of the phylogenetic relationships within the genus Hynobius, variations in repetitive DNA were examined in ten hynobiid species, namely, H. kimurae, H. leechii, H. lichenatus, H. nebulosus, H. nigrescens, H. quelpaertensis, H. retardatus, H. tokyoensis, H. tsuensis, and Onychodactylus japonicus. The data from Southern blot hybridization were processed by Manhattan distance analysis, and unrooted trees were constructed. The resulting trees suggest that the genus Hynobius can be divided into three groups: group 1 contains only H. retardatus with 40 chromosomes; group 2 contains H. kimurae, which has 58 chromosomes and is a mountain-brook-type Hynobius species (this group probably contains all mountain-brook-type Hynobius species with 58 chromosomes); and group 3 contains the other seven species examined, each with 56 chromosomes. Group 3 probably contains all Hynobius species with 56 chromosomes and can be further separated into two subgroups: subgroup 1 includes H. leechii, H. nebulosus, H. nigrescens, H. quelpaertensis, H. tsuensis, and H. tokyoensis from Chita, Aichi; and subgroup 2 includes H. lichenatus and H. tokyoensis (excluding the population from Chita). According to this analysis and other information, it seems that the population from Aichi should be identified as H. nebulosus or as another species closely related to H. nebulosus phylogenetically. Furthermore, it appears that the genus Onychodactylus is phylogenetically distant from the genera Hynobius and Salamandrella (Fig. 1). Figure 1. A dendrogram for the three genera, Hynobius, Salamandrella, and Onychodactylus, belonging to the family Hynobiidae, based on chromosomal and repetitive DNA analyses. Only the branching pattern is indicated in this figure. This study was supported, in part, by a Showa Seitoku Memorial Foundation and by a Narishige Zoological Science Award. 1990-1991 Research Student at Department of Biology, Faculty of Science, Toho University. 1991-1993 Fellowships of the Japan Society for the Promotion of Science for Japanese Junior Scientists (JSPS Fellowships for Japanese Junior Scientists) Visiting Research Scientist at Department of Biology, Faculty of Science, Toho University. Molecular Phylogenetics and Evolution 83: 1-6 (2015). Nagai, Kanae Hama, and Hayato Yagihashi, Genes and Genetic Systems 90: 380 (2015). 4. Two lineages of Hynobius tsuensis based on mitochondrial DNA analysis. Keita Niwa and Masaki Kuro-o, Bulletin of the Herpetological Society of Japan 2017: 64 (2017) [in Japanese]. Motokawa, Bulletin of the Herpetological Society of Japan 2017: 99 (2017) [in Japanese].